712.425 routes to Rome. 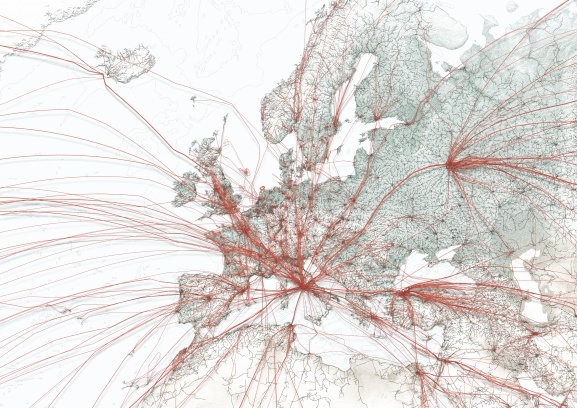 People driving to the airport *black lines* and hop on a plane to go to Rome *red lines*. The underlying baselayer shows the general topography and in addition: elevation in Cross-blended Hypsometric tints *shaded green*, bathimetry *blue underwater contour line* and urban areas dark *grey areas around cities*. 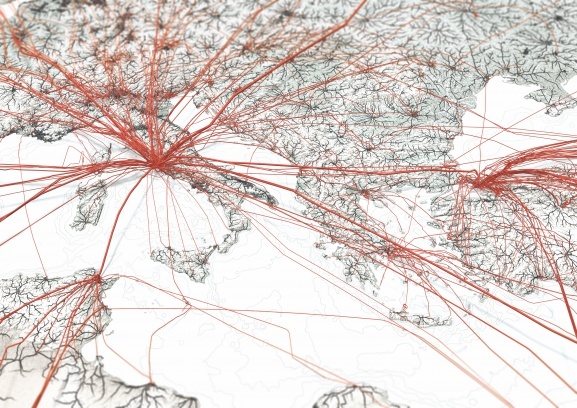 “Flights to Rome” is a data visualization art project showing the entire global mobility network of flight and road infrastructure in a single image. 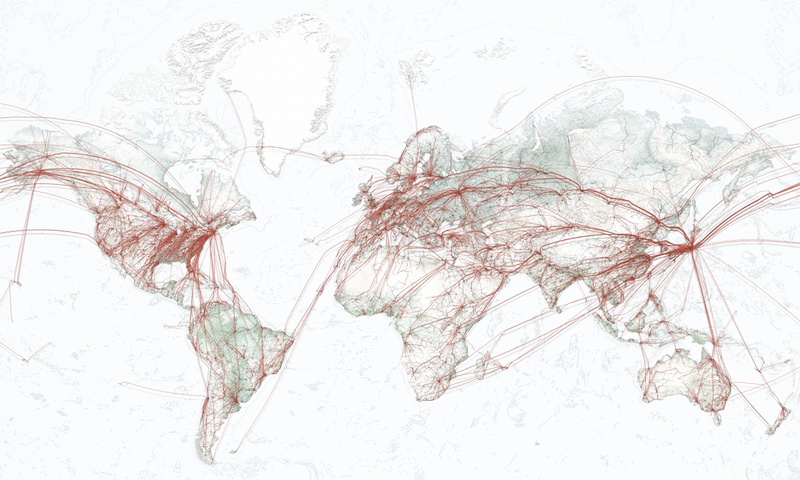 It visualises for the very first time literally traveling from everywhere to everywhere on this planet. Do all roads lead to Rome? This is the question which inspired our project “Roads to Rome” (Dec 2015) and its successor “Flights to Rome” (Jun 2018). The proverb “all roads lead to Rome” is, by a closer look, a very interesting suggestive mobility statement. The goal of R2R was to find an automated way to visualize this saying. 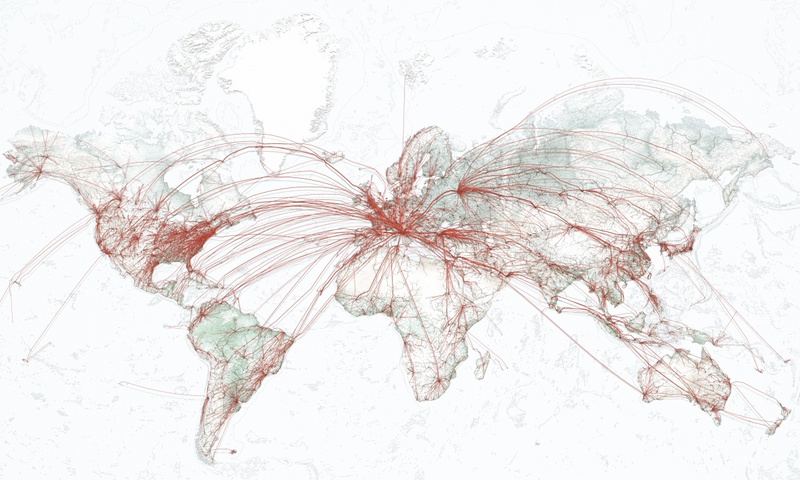 F2R addresses two additional aspects which the authors couldn’t figure out for the first iteration of the project back in 2015: 1. from really everywhere to everywhere on a global scale and 2. intermodal traveling of more than a single (road) mode of transport. As the visualisations of R2R relied on OpenStreetMap road data, it was conceptually never possible to render maps “leaving” a continent, as you simply can’t drive with a car from Europe to North America. By mining a 7 days dump of real world global flight air traffic (week of Jan 9 to 15 2017, data by FlightRadar24) to a route-able graph, by combining this flight graph with the existing global OpenStreetMap road data, and extending the open-source routing engine Graphhopper with an additional flight mode of transport, we were able to create a joint intermodal routing graph to calculate intermodal flight and road traveling routes in a realistic way. The resulting images are not only visually intriguing but also allow conclusions about how flight and road infrastructure reflects regional, political and geographical situations on a global scale. Eastern traffic tends to enter via Moscow. 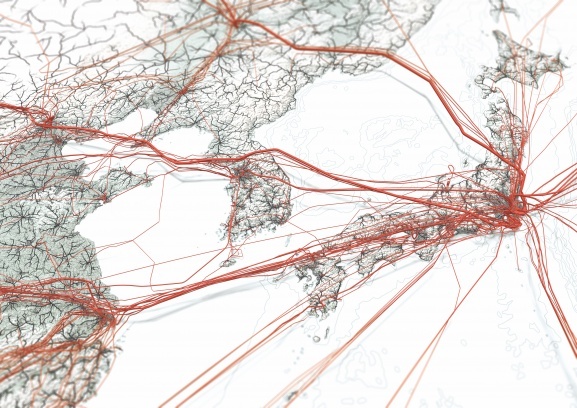 Connections to the west are more diverse and not as bundled. Note also how all east coast traffic is routed via Iceland, while west coast origins fly in via Paris and London. Far eastern and Indian traffic flows enter via Istanbul while some southbound traffic is bundled in Tunis. 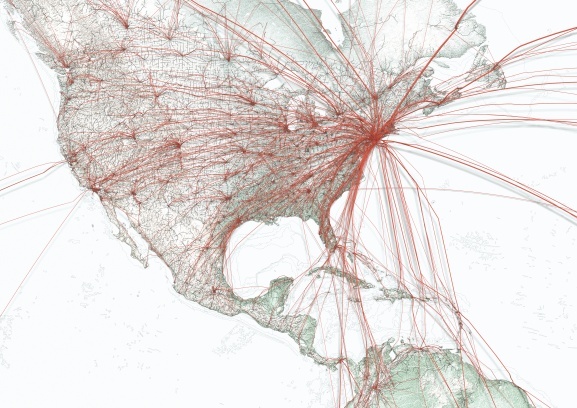 The travel patterns of the US Mainland only. “Leaving Alaska” - In remote, yet domestic, areas like Alaska, we still find that a lot of small airports connect to one main hub, Anchorage in this case. Due to the harsh and vast environment the land route can be very difficult. 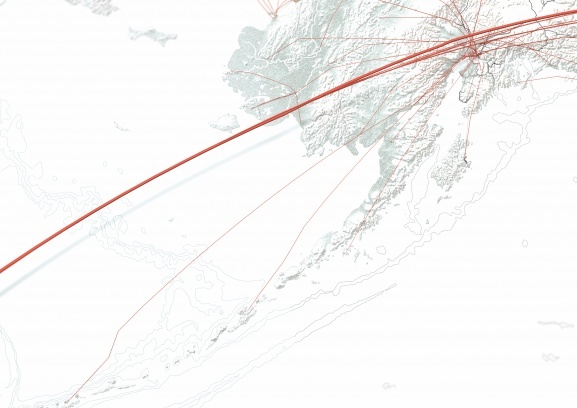 Travellers from Anchorage would have to transfer to another connecting flight in order to get to New York City. For Alaskans air traffic is an essential way of travelling. To reach east you must go west. At least for most travellers from North and South America this is the case. 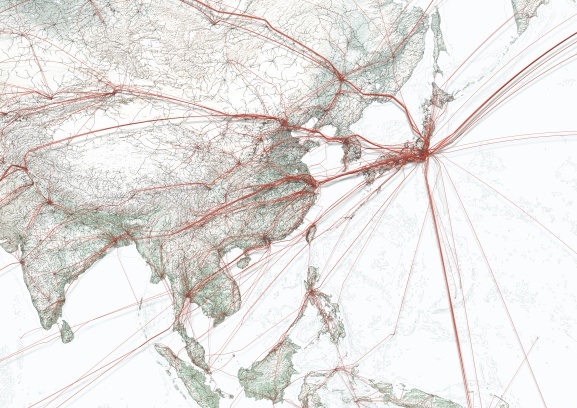 Interestingly only travellers from west Brazil actually fly east to visit Tokyo in the Far East. Aircrafts approach in very specific streams. While North Korea lifted its ban on foreign airplanes over their territory in 1997, there are several bans from international aviation organisations on the area. The main reason for the ban is the erratic and sometimes unannounced missile testing in the region. Flights to Rome swiftly explained in 5 minutes.